Humans and dragons have lived in proximity to one another for a million years or more. It was probably on the African plains that the earliest humans first learned about the use of fire for cooking food by watching dragons. However, we have very little knowledge or information about these early encounters. We do know that by the time of the early Egyptian period a considerable dragon and serpent-worshipping cult had developed. This cult gradually spread to Babylon, India, the Orient, the Pacific Islands, and finally the North American continent, as more and more cultures began to recognize and appreciate the special powers and intelligence of dragons. The cult reached its peak during the days of the Roman Empire and disappeared with the advent of Christianity. Gradually the concept of a mother goddess, often in serpent form, was replaced with a father figure that was distinctly anti-dragon. Dragons were especially common in the mountains of Scandinavia. One of the most feared of the early Nordic dragons was named Nidhoggr, or the "dread biter. " He lived for thousands of years and was believed to have spent most of that time gnawing at the root of the universal tree of life, a gigantic ash tree that supported all the living realms. But most of the dragons of Scandinavian lore were large aquatic creatures that lived off the coasts among the swirling waters. It was said that these aquatic dragons, or Krakens, lifted their enormous heads and long necks out of the water to seize sailors right off their ships. Much of the supposed violence caused by the Scandinavian dragons, however, has been confused with that wreaked by the plundering Vikings, who usually placed a dragon's head on the figureheads of their great ships. Their victims believe that an actual dragon had come to destroy them. The viking warriors plundered and pillage over much of the northern lands. Thus, as on numerous occasions, dragons were blamed for the evils that mankind had brought upon itself. Dragons were believed by the Greeks to be great sources of knowledge and wisdom and were considered sacred creatures with oracular abilities by both Greeks and Romans. Small non-venomous snakes were commonly kept in Roman households, where they no doubt kept the mouse and rat population in check and they were called dracunculi, or little dragons. Treated as pets, they slept in various nooks and crannies and were fed at the table like dogs or cats. Serpents were to be found at shrines, where they transmitted their great wisdom through the mouths of priestesses. Python was the name of one such serpent-dragon, which guarded the shrine at Delphi until Apollo killed him. Another dragon, named Ladon, faithfully guarded a tree of golden apples (perhaps a clutch of golden eggs) that belonged to Hera, and the apples contained the secrets of knowledge and immortality. One of the many tasks of Hercules was to kill this dragon and bring back a few of the apples to King Eurystheus. 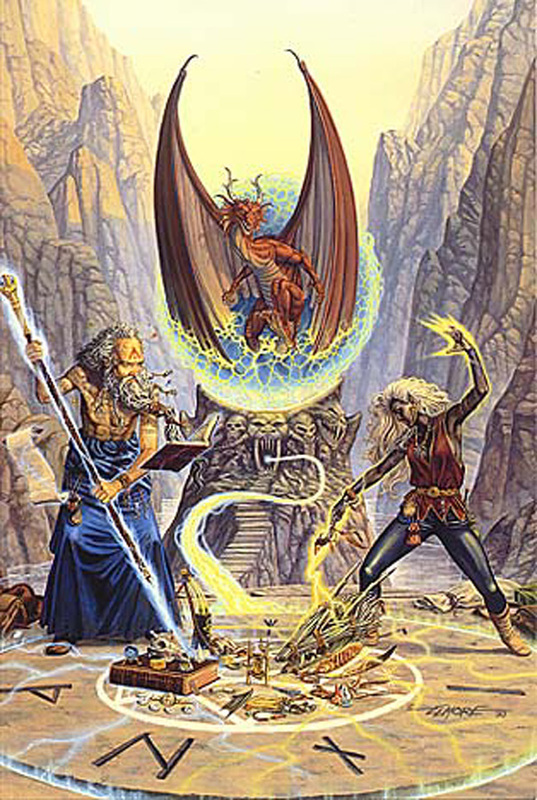 It is from this encounter that we can place the popular image of dragons as the guardians of great treasures and the custodians of forbidden knowledge. 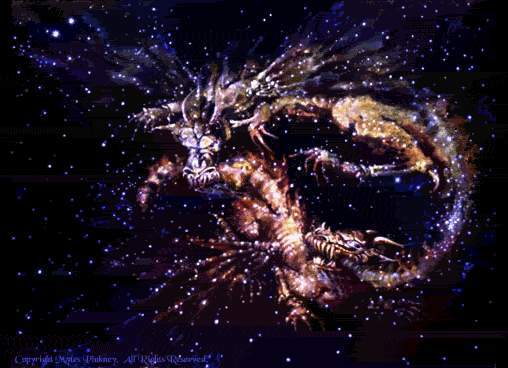 The great battle between Ladon (or Draco) and Hercules is forever enshrined in the constellations of the northern skies, where Hercules may be seen trying to step on the dragon's head. Dragons soon disappeared from Greek and Roman homes and oracles, and were no longer available for transmitting their wisdom to those who wanted to learn from them. The total decay of the Greek and Roman civilizations followed inexorably. For many centuries thereafter, as the Dark Ages descended on Europe, dragons were greatly feared. 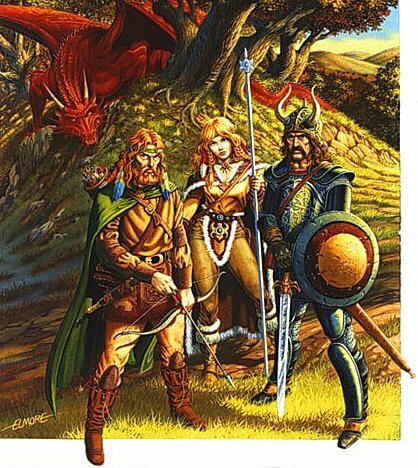 Fortune seekers, vainly hunting for the treasures of gold that they thought the dragons guarded, sought out breeding weyrs and stole dragon eggs, and many a knight tried to impress his girlfriend by slaying a dragon or two. One of the earliest known dragon slayers was the warrior Siegfried (in the Teutonic version), or Sigurd (Scandinavian version), who lived so long ago that the facts of his dragon-battle are greatly muddled. 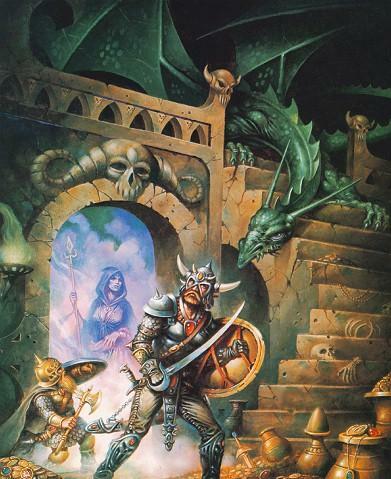 Some people believe that he slew the dragon Fafnir to rescue a captive maiden, in other accounts he was simply looking for treasure. Some centuries earlier, in England, Beowulf took on a similar dragon but was fatally wounded in the resulting battle. Clearly, the weapons and methods used by these early warriors were not always equal to the task. The first really epic battle between man and dragon that comes down to us in any detail is that of Saint George. He lived before the time of Constantine and was probably born in Palestine. During one of his travels, he came to the city of Silene (or Sisena) in Libya. There he learned of a dragon, living in a nearby lake, that was reputedly raiding neighboring pastures and eating the sheep. After all the sheep had disappeared, the townspeople found it necessary to offer up all their children to the dragon, until only the daughter of the king remained. By the time George arrived on the scene, even the king's daughter had been bound up and was about to be offered to the creature. Without delay the good knight attacked the surprised dragon with his lance. He quickly bound the dragon up with the princess's girdle. He led the cowering beast back to the city, where he killed it by slicing off its head in a single blow, in view of the entire populace. In spite of this good deed, George eventually came to an unhappy end. According to some accounts, he tore down and impulsively stamped on an edict that had been issued by the Roman Emperor Diocletian, for this foolhardy act he was arrested and eventually put to death. Others said, that he was decapitated by the emperor of Persia for trying to convert the emperor's wife to Christianity. Clearly he didn't have the good sense to stay away from the wives and daughters of royalty, and he was probably not greatly missed until he was made a saint some centuries later. In 349 B.C. he was even made the patron saint of England. He was also given honorary, if posthumous citizenship there, since it had by then been decided that he had actually been born in Coventry. In the sixteenth century, Pope Clement VII decreed that George had not been completely truthful about his dragon-killing stories, and the pope decided to eliminate all mention of dragons from St George's official biography. More recently, poor George was even de-canonized, and the arguments over which cathedral actually possesses his head and other bodily parts have gradually diminished. 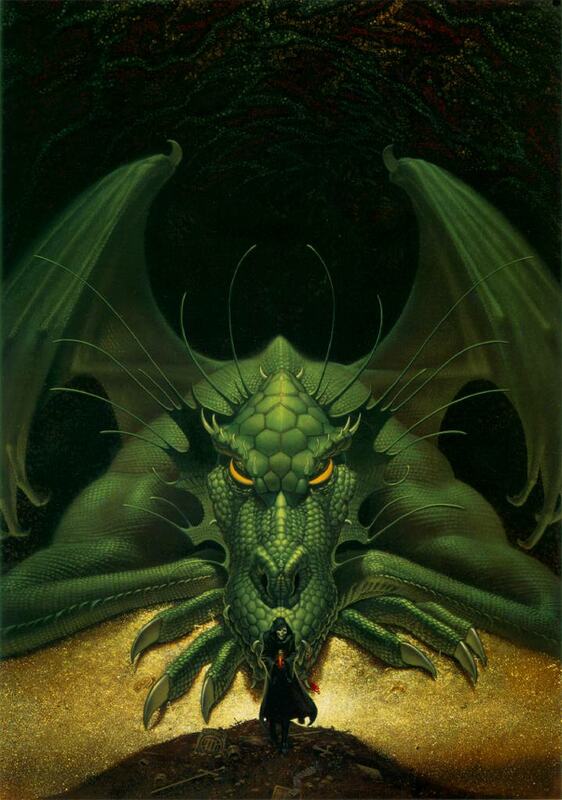 Not nearly so well known as George was another dragon killer of the Dark Ages by the name of Gerolde. He acquired during his lifetime a large and faithful following of people eager to hear of his dragon-slaying exploits. For many years he roamed the countryside seeking dragons and other evil creatures, speaking out against them, and burning any books that mentioned dragons or their kin. He was eventually made a knight and was dubbed Gerolde-the-Good, because of his obvious piety. His minions formed what was probably the first fan club in history and referred to themselves as the pious multitude, whose major goal was to seek out and destroy sin in all of its many forms. The first dragon that Gerolde slew was a relatively small one only about twenty feet long) that he managed to surprise one day while dressed in his shiniest suit of armor and riding his charger. Without a thought for his own safety, he attacked the beast. The reflections of the sun off shiny armor dazzled the dragon, and before it could retaliate, it found itself fatally impaled on Gerolde's long lance. 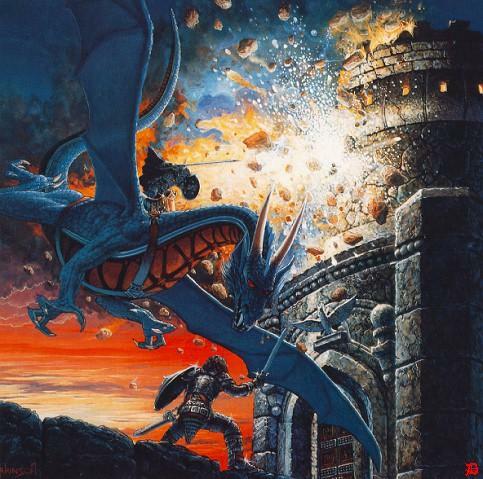 Gerolde was immediately hailed as the greatest of all dragon killers, and he was swamped with requests to speak before civic groups and to clear dragons out of various strongholds. He traveled about the land with his entourage and was offered rich presents and rewards for his good deeds. Among these were numerous brightly colored silk garlands and ribbons, which well wishers begged he would attach to his lance or his helmet for good fortune. Finally, Gerolde had the clever idea of making an entire multicolored jacket of these ribbons, which he could slip over his armored suit. He was immediately transformed into a flag like vision of blue, white, red, and green. Shortly thereafter, clad in his colorful garment, he encountered a large dragon and attacked it with full confidence in his invulnerability. This time, the jacket effectively hid the reflective armor, and clouds hid the sun. The dragon, upon being attacked, released a vast amount of fire, incinerating Gerolde on the spot. His followers were badly shaken by this turn of events but nevertheless recovered his charred remains and returned to town. He was buried in a nearby cathedral with all possible honors. On his grave a simple epitaph was engraved in Latin, which in translation reads "Never wrap yourself in a flag when you go forth to slay a dragon. By the end of the Middle Ages and the beginning of the Renaissance, a godly number of dragon slayers had hacked their way into history, and many had been made saints in the process. The killing of dragons had become one of the few suitable ways of performing heroic acts of warfare and aggression and to be rewarded with fame, fortune, and sainthood.